While at USC, Barnet Kellman was the first to introduce him to the world of comedy. His directing class, with an emphasis on comedy, solidified his commitment to the craft. One day in particular, another student was workshopping a scene that wasn’t working. Kellman gave a quick note to one actor and had them redo the scene. The note completely transformed the scene. This was an “aha” moment for him that showed him what directing was really about. With a better understanding of comedy, there was no looking back for him. 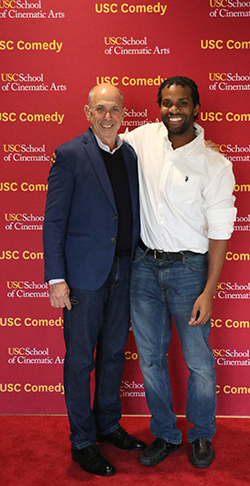 After graduating, Story credits USC Comedy’s seminars with other comedic directors to his further growth and understanding of comedy. For him, USC Comedy has been just as beneficial as an alumna to his creative process and growth as it was when he was a student. Keeping in touch with his mentors to break down scripts and generate feedback has helped him take his projects to the next level. Now, Bomani is working on various projects. He can’t give too much detail at the moment but he says we’ll know very soon!